From high purity powders and master alloys to high precision strip, foil and wire to high performance metal tubes, SMP products are globally recognised for their outstanding quality, reliability and added value in critical aerospace applications. 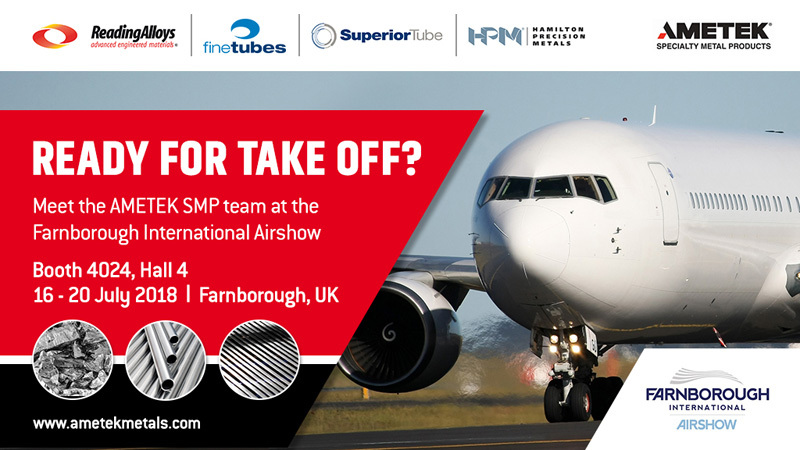 SMP will be represented at Farnborough with it’s four leading brands: Fine Tubes, Superior Tube, Hamilton Precision Metal and Reading Alloys. The businesses’ operation facilities are based in the United States and the United Kingdom. Together we provide a one-stop source for the titanium, stainless steel, nickel and specialty alloy materials required for commercial and military aircraft as well as space programmes. Fine Tubes and Superior Tube manufacture high performance tubes for fuel lines, actuation and instrumentation systems as well as high pressure tubes for hydraulic and pneumatic control systems up to 5,000 psi. Hamilton Precision Metals produces the metal strip used in diaphragms for aerospace sensors, nickel-based strip alloys for aerospace batteries, heat exchangers and bellows, brazing foils for jet engine fan blades and housings, and shaped wire for push-pull mechanisms, fuel shutoffs and fasteners. And Reading Alloys supplies master alloys for Titanium and Superalloys used in airframes and engines as well as powder coatings for thermal barriers, wear barriers and surface enhancements. To discuss how we can support you with your challenging projects, join AMETEK Specialty Metal Products team for a coffee meeting at Booth 4024, in Hall 4. Check-in with us now to reserve the best time for you!